Pulled pork is an awesome go to recipe to have in your repertoire for pot-lucks, big gatherings, make ahead lunches, and teen aged boys. This particular recipe I discovered when a friend was hosting a luau themed party and I needed a main dish. I kind of like themed parties, it breaks up the monotony of the daily grind. I’m not so into it that you’d find me cosplaying at a Comic-Con (although I have attended one-ask me about the time I met Darth Vader!) This particular party was appropriate because it was early summer, there was a pool for ambience, and the party goers were game enough to wear Hawaiian shirts, listen to Don Ho music and eat pineapple. You’ve got to love friends who are willing to put their dignity aside for the sake of merriment. So this recipe is supposed to mimic the taste of an authentic luau roast pig that you cook underground for a day or so before the party. I have no idea whether it actually does or not, but it tastes great, smells divine, and I always get compliments when I bring it somewhere. The best part-there are only three ingredients. That’s right. Three. I’m also pretty sure that this recipe is the easiest one on the planet, anyone can make it. Prep time is under ten minutes, and then you walk away and leave it for up to 24 hours. Dinner you make the night before. Perfection. Ok, so here is my recipe. Buy the biggest piece of pork that you can find that will fit into your slow cooker. Trim any extra fat off of it before you cook it. Take a fork and stab it repeatedly on both sides. If you had a bad day at work this will easily be your favorite part. Put the roast in the slow cooker. Set it to low and cook for 20 to 24 hours. Seriously. 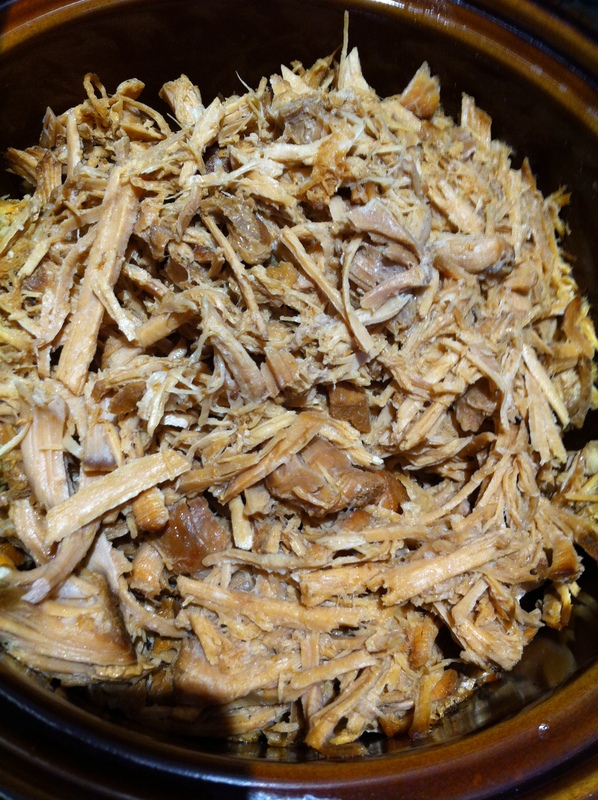 Take the roast out of the slow cooker, shred it using two fork, and return it to the slow cooker, letting it sit in the juice. Keep warm until serving time, and serve as is or on buns. That is all there is to it. How easy is that? Ideally you are supposed to use pink Hawaiian sea salt but I can’t find any in my local stores. Maybe there is an international Hawaiian salt shortage, I don’t know. There is plenty of Himalayan pink salt to be found, but I’m guessing that it won’t be a good substitute. What I did end up doing was finding coarse pink sea salt in the health food section. The liquid smoke was found in the seasoning section of a larger grocery store, I cannot vouch that a smaller store would have it. Once you get a bottle though it will last a long time. I’m still on my first bottle and it has made a good number of pulled pork roasts. I only have one complaint about this recipe, it’s something that I fall for every single time I make this. 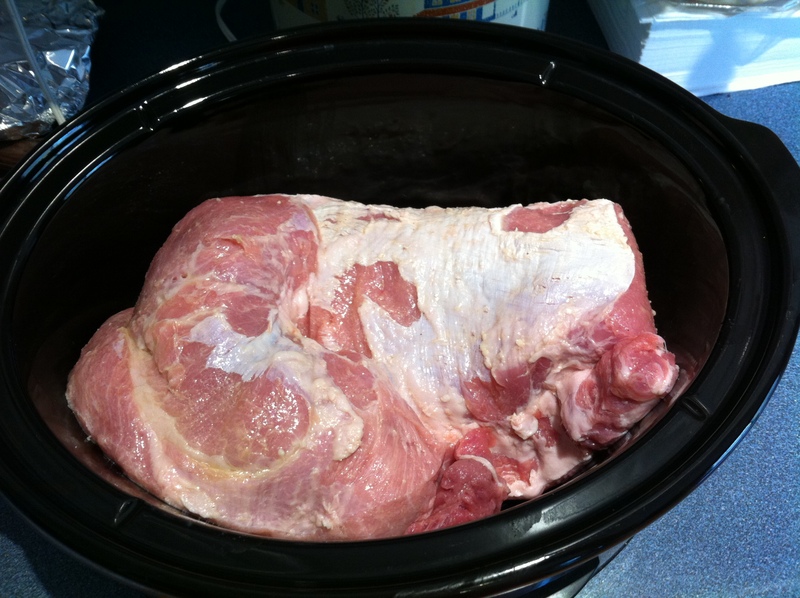 When I prepare the pork I typically make it around 7:00 pm after dinner is cleaned up. I prep it and walk away, essentially forgetting about it. Every time, after cooking all night, I wake up in my bed to the delightful smell of bacon. I get excited because surely that means my husband is already awake and surprising us with breakfast. Coffee, bacon and eggs, or maybe pancakes. I smile and inevitably look over at his side of the bed only to find that he’s still asleep. It’s the pulled pork, it has made my entire house smell like bacon. Except there is no bacon, and breakfast as usual is on the menu, which tends to be cereal or toast. 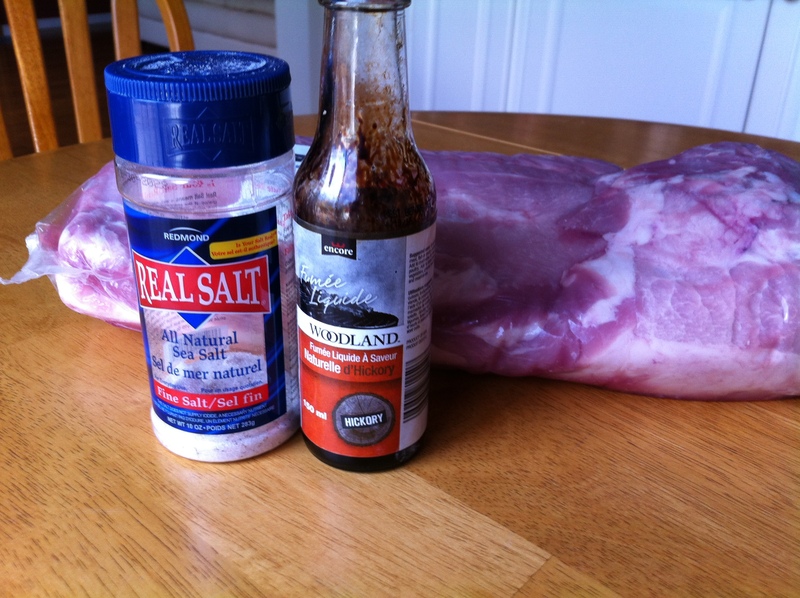 So there you have it, incredibly easy pulled pork that will win you rave reviews and make your house smell like bacon.